Full confession: I write as a relatively recent member of the Easton Lions Club, where I serve as a liaison between it and the Ames Free Library. I can in no way be held to standards of objectivity because I have none. I am an unabashed fan of both organizations and couldn’t be more proud to belong to both. 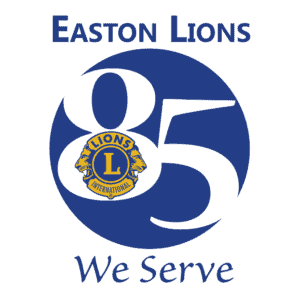 This year, the Easton Lions Club celebrates its 85th year in Easton. Who knew? It’s been a solid force and presence in our community since 1931! What is the Easton Lions Club and what is its mission? In its 85th year, the Easton Lions can proudly say it is the largest Lions Club in the state of Massachusetts, and that “Lions Serve.” When did it get started, and why does it serve the town? Why does the Easton Lions Club do what it does? For the Easton Lions Club, I have discovered, having fun and raising funds for important projects in the community have always gone hand in hand. I first got to know the club when I was the parent of a young child. As my daughter got old enough to walk, I took thorough advantage of what the Lions offered families: the delights of the annual Halloween Parade, the overarching & many faceted Rockery Holiday festival, Yardley-Wood Rink with its ice-skating and canoe lessons, and truly fun, family summer concerts in Frothingham Park. For years, my husband, daughter and I walked to the Rockery for the lighting on those dark and often freezing cold Saturdays when the beautiful lights snapped on. The following day, Sunday, we’d stand at the end of Pond Street, avidly watching the parade with decorated floats covered friends and schoolmates. As candy was flung in our direction, the kids would squeal with delight, rushing into the often slushy streets to collect it in bags. We watched as various veterans and representatives of the town, and finally Santa Claus, who waved at us, went by. The Rein-dog parade, added several years back, became a regular feature, an unapologetic display of cuteness, which included our neighborhood dogs. We wouldn’t have missed it for the world. We followed the parade to the center of town to eat fried dough and ride on small trains or horse-drawn carts around town, among many other activities. 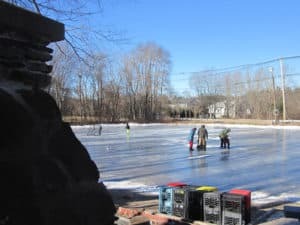 We regularly attended Dale and the Duds concerts at Frothingham Park where our daughter danced with other children close to the musicians, and regularly swapped skates at Yardley Rink. Two years ago, as our daughter got ready to go to college, the Lions added a talent show to the Holiday Festival, and just last year started a new math competition for kids. We will never forget those years and all the fun and engagement they gave us. Now that I am older, I regularly visit the Grange Thrift store on Washington Street, haul big things out for Junk Day and take part in the yearly auction. Recently, a neighbor bid on and won a car for her son through the auction, and another friend donated one. The Easton Lions Club has been wonderful for our family and the town, yet I never bothered to figure out why this was offered, or who was behind it — until recently. Looking into the club’s history I learned that the very first meeting was held on October 1, 1931, sponsored by the Attleboro Lions Club. Charter members were doctors and dentists and other influential people in town, people who wanted to and could make a difference. There were also business owners, teachers, firemen, and restaurant owners. Right from the start, the Easton Lions Club always has known how to have a good time while raising money. The fun we have at our meetings twice a month including a social time and a delicious catered dinner and an ongoing raffle, has many precedents. Back in the ‘30s, the club added to its charity basketball games and whist parties with lobster suppers, bowling, Ladies Nights, lectures and movies. The money collected paid for Thanksgiving baskets, tonsil extractions, the ongoing dental clinic and eye exams with eye glasses for those who needed them. 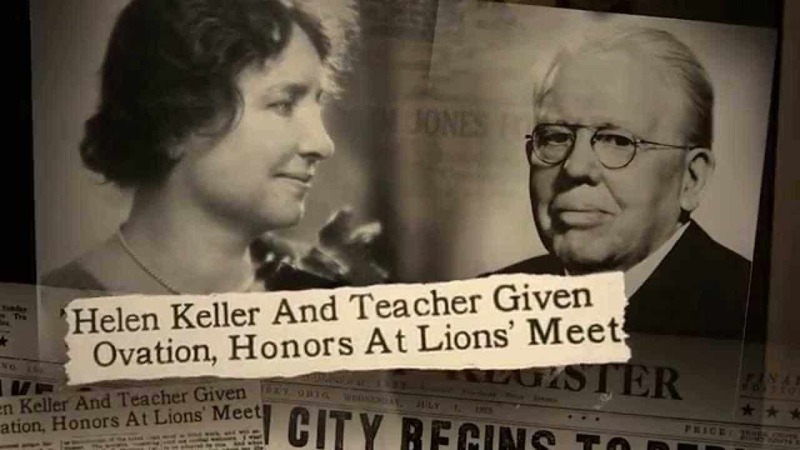 The Easton Lions, like all Lions Clubs, following an entreaty by Helen Keller, promised to become Knights of the Blind. While funding eye research has been a major objective, answering the needs of our community has always been the Lions main mission. Beginning its service during the Great Depression wasn’t always easy, but serve they did. In January, 1933, the Easton Lions staged a basketball game for the benefit of installing a dental clinic in the High School with dentist Dr. Hal Smith at the helm, and “netted $75.00 to pay for the examination of all the school children in town” to make a start on what they called the “treatment of worthy cases.”Lions Club members made huge contributions to the town through the money they raised. There were eye examinations and glasses for needy children funded by Ladies Nights and whist parties where sums of money, sometimes “over $18”, were raised. In the midst of the Depression, the Easton Lions Club came through for people. Fun fundraising vents also allowed the club to continue its dental clinic, and contribute to the Red Cross and the Christmas Relief Funds. 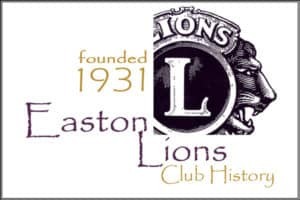 Did you know that in 1933, the Easton Lions are the first club in town to suggest to selectmen that they use the skills of the unemployed to straighten dangerous curves on one of “our main roads,” or they raised money to buy a rescue boat for the Fire Department to save people from drowning in Easton’s many waterways? Civic mindedness knows no bounds with the Lions’ Club. The Lions Club has always moved with the times. In September, 1942, the Easton Lions set out through a newly formed Military Affairs Committee to raise money to send Christmas Boxes to all Easton men in the service. It was deemed the “largest and most successful project every attempted by our club.” The names of 300 Easton service men were gathered, their military addresses located, and Christmas boxes prepared. The entire town was canvassed for funds until the club reached its goal of $1200. Packages were sent to every Easton man on duty overseas that year. Later during World War II, baby chicks were given to 4H members to be raised for food, with the understanding that two would be donated back to the Lions Club for one of its monthly dinners. Two thousand tomato seedlings also were distributed for Victory Gardens. Membership rose and fell over the years. Men joined in from all walks of life, just as it is now (with women added of course). Easton was until recently a rural community and rosters were made up of blacksmiths, ice dealers, poultry farmers, grain dealers, butchers, dairymen and market gardeners as well as salesmen, grocers, machinists, woodworkers, electricians, engineers, executives, bankers, plant managers, attorneys, clergymen, teachers, and many more. Then as now, if a job needed to be done, there was a Lion capable of volunteering his expertise to do it. In the fifties and sixties, club members honored the service men of World War II and the Korean War by erecting a Memorial Stone at the Easton Green. A Child Welfare Night became an annual event, and continued to raise important money for needy families. In more recent times, other ways of raising money took shape. There were golf tournaments and dances held to raise money for scholarship awards. Along the way, the Lions put up money and time to erect a chain-linked fence around playgrounds “for children’s safety” and paid for road signs. Eye clinics continued to be funded, and kids who needed them were still given eye glasses. In the 1990’s Club members turned to helping elderly residents by providing glasses, building ramps to increase home accessibility, and visiting nursing home with holiday gifts. A yearly weekend TV auction was added in 1986 to raise money for projects. A huge event for the Lions, donations come from generous people throughout the community. For many years, the auction and the Holiday Festival, also started in 1986, were the major fundraisers for the club. As the needs of the community grew, the Lions added other fundraisers such as the annual Junk Day. Most recently the successful Thrift Store, staffed solely by Lions volunteers, and open Wednesdays and Saturdays at the Grange on Route 138, became another source of funds. Easton Lions community projects always touch people locally, but sometimes their impact stretches around the world. Recently, my daughter returned to Cambodia to give back to her birth village by purchasing bicycles for 100 people living there. The Easton Lions Club stepped in to help fund her project, and connected her with a group of Lions in Phnom Penh, who, like the Lions of Easton, were kind, generous and stepped right up to help serve. What I have learned over the past few years is that the Easton Lions Club is that a small but potent army of men and women who serve the town of Easton with a good-heartedness and an unstinting dedication that boggles the mind. Not only does this award-winning club provide good spirited family fun by hosting multiple events. It’s also always busy raising money to fund important projects throughout the community – scholarships for students, equipment for Girl and Boy Scouts, equipment for the visually impaired at the local library, money to boost the schools, and other projects too numerous to mention from fighting hip dysplasia to supporting Wings of Hope. Bravo, Easton Lions Club. You are truly the unsung heroes of Easton!